The CN Tower in Toronto is one of the tallest towers in the world and Toronto's most popular tourist attraction. Where Is the CN Tower? One thing about the CN Tower is that it's not hard to find. Look up and you will see it from most any place in the city. It is close to the waterfront and not far off the major highway that accesses Toronto. The CN Tower is located at 301 Front Street West, between the Rogers Centre—Toronto's sports dome—and the Toronto Convention Centre. Despite being a hard-to-miss landmark, the actual entrance to the CN Tower can be a little confusing, especially for those with strollers or who need wheelchair access. At the foot of John Street on the south side of Front Street is a set of stairs that takes you to the entrance of the CN Tower. To the right of those stairs is a wide ramp that leads to both the Rogers Centre and the CN Tower entrance. For those who need wheelchair access, halfway up the ramp on the left are glass doors that lead to an elevator that takes you down to the CN Tower entrance. These doors are not well marked, so keep your eyes peeled. By subway, get off at Union Station, exit at Front Street and head west, that is, turn left (again, just look up). Via trains coming in from other Canadian cities and GO trains arriving from more local places like Hamilton arrive at Union Station, a 5-min walk to the CN Tower. From the South or West (Buffalo, Hamilton, Oakville): Follow the QEW into Toronto, where it turns into the Gardiner Expressway. Exit onto Spadina Ave. North and turn right onto Bremner Blvd. From the East (Montreal, Kingston, Ottawa): Take Highway 401 into Toronto and exit onto the Don Valley Parkway Southbound. As you approach Downtown, this will turn into the Gardiner Expressway. Exit at Spadina Ave. North and turn right onto Bremner Blvd. From the North (Muskoka, Barrie): Take Highway 400 into Toronto, exiting onto Highway 401 West. Continue until you reach Highway 427 southbound. Follow Highway 427 to downtown via the QEW/Gardiner Expressway. Exit onto Spadina Ave. North and turn right onto Bremner Blvd. Parking in downtown Toronto, like in most big cities, is frustrating and expensive. That said, public parking lots are well-marked and plentiful around the CN Tower. If you're willing to walk 10 mins, you'll find parking prices drop significantly west of Spadina. Admission to CN Tower for children under 3 is free. CN Tower is a bustling place with lots of walking - or waiting in line. Bringing a stroller for younger children is a good idea. 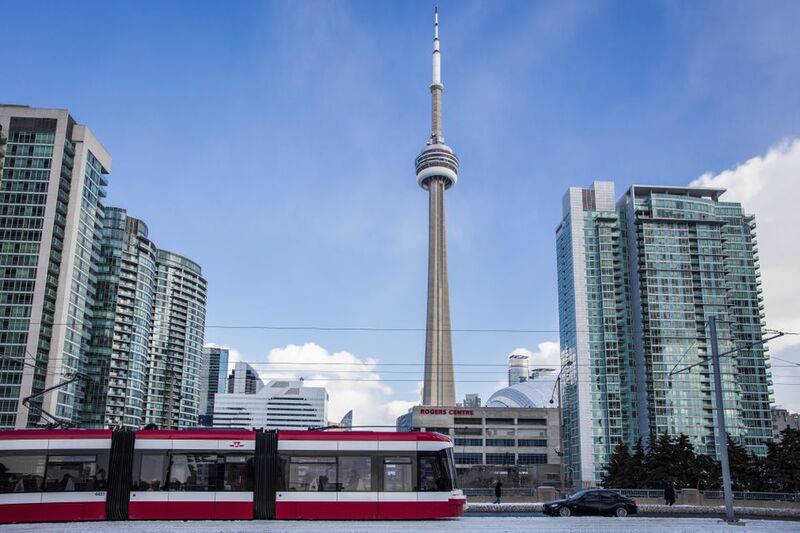 Parents can take children in their strollers to all parts of the CN Tower, including the highest observation point—Sky Pod—and the fine-dining 360 Restaurant. Change stations and family washrooms are available throughout the CN Tower. Highchairs are available at 360 Restaurant and Horizons. EdgeWalk is the world’s highest full circle hands-free walk on a 5 ft (1.5 m) wide ledge encircling the top of the Tower’s main pod, 356m/1168ft (116 stories) above the ground. CN Tower is open every day except December 25th. Some attractions have more limited hours. Marketplace is a fully licensed family eating area on the ground level with fast food and snacks. A kiosk on the Look Out level offers nice sandwiches, drinks, ice cream, and other snacks. Horizons is the less formal dining establishment on the Look Out level of the CN Tower. Nevertheless, it's a lot better quality than you'd expect for a tourist attraction restaurant. Far from cafeteria dining, Horizons has all window seating on the Look Out of the CN Tower and a sizeable menu including appetizers and full entrées such as quesadillas, panini, salads, chicken, and a nice selection of beers and wine. The CN Tower restaurant, 360, is more than just a spectacular view. The recipient of several culinary awards, 360 also features an extraordinary wine list of more than 550 international and Canadian wines. Diners at 360 do not pay regular admission price and get preferential elevator service to the restaurant more than 350 meters (1,150 ft) above.